Afternoon in Oklahoma City: Heat at Thunder | Have Game? Will Travel! My only savior was my second cousin who was a senior at the University of Tulsa. He was joining me for the game and picking me up and dropping me off at the airport. 1) My plane was scheduled to land two hours before tip-off. Any delays could cost me valuable time on the scalping market and if the flight was really late there may no longer be any tickets available. 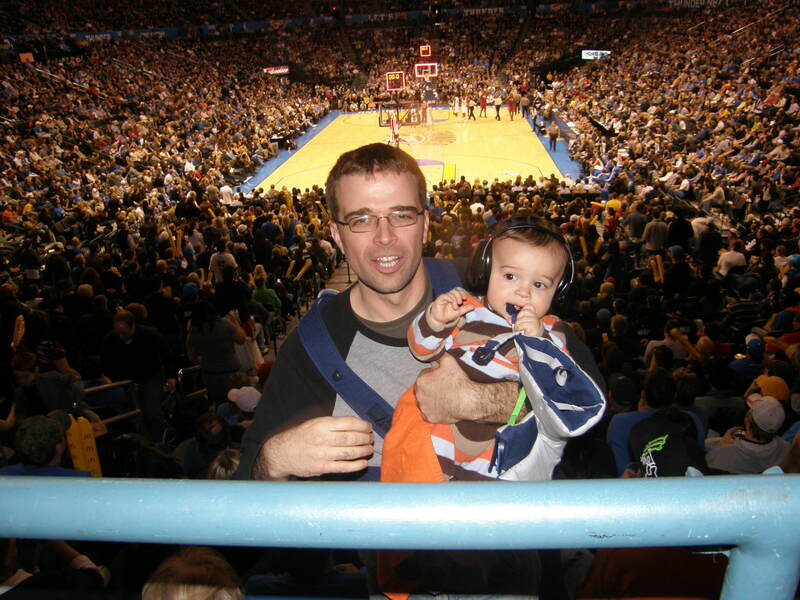 2) I had the Ultimate Sports Baby with me – meaning it would be more difficult to buy tickets from scalpers since I would have to wheel him around in his stroller. 3) The same seats I paid $70 each for on Ticketmaster.com were ranging in the low $200’s on StubHub – so even tempting the secondary market may not give me as low a price as I bought on Ticketmaster. As luck would have it, my flight landed on time, my cousin picked me up and we were off to downtown Oklahoma City. We parked a few blocks from the arena for $5 and were out of the car by 10:30 am – plenty of time before the noon tip-off. From the parking lot we walked through the Cox Convention Center and found the Blue Line Restaurant within the convention center. We chose to eat there since it was directly across the street from the arena and had a high chair for the Ultimate Sports Baby. It was a battle of top teams as the Miami Heat had LeBron James, Dwyane Wade and Chris Bosh together on the court for the first time in eight games. Miami’s big three each scored 20 points or more and Eddie House hit the go-ahead three-pointer with 22.2 seconds left. Kevin Durant missed a seven-foot jumper to tie the game with 14 seconds left. The Heat made three more free throws to win the game 108-103.